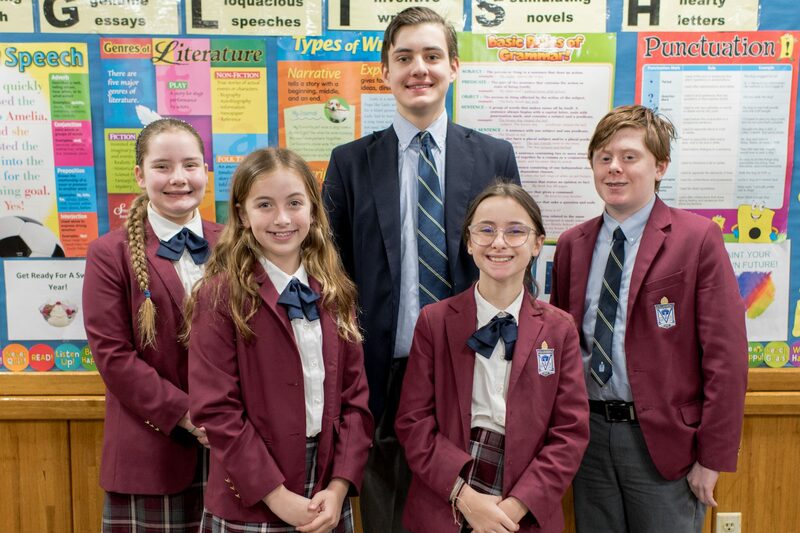 Congratulations to our talented and competing students in the Latin School. They participated in the annual Catholic Daughters of the Americas contest sponsored by the Bishop Kellenberg Court located in North Merrick, NY. The entries of our five winning students exemplified the themes of “Here I Am Lord I Come To Do Your Will” or “Doing My Best To Do Good.” The contestants demonstrated their skills, imagination, and creativity in their selected essays, poetry, art, computer art, music, and photography samples. Awarded were the following sixth and tenth-grade students: ESSAY – Connor Griffin (6); ART – Virginia Bruder (6); PHOTOGRAPHY – Elizabeth Rizzo (6), COMPUTER ART – Ella McAleer (6); and MUSIC – Evan Carroll (10). An awards ceremony and celebration was held on March 18, 2019, at the Sacred Heart School in Merrick to reward their achievements with prizes and certificates from the Catholic Daughters of the Americas. Congratulations to our accomplished winners and their notable achievements.